Invasive species are increasing across the Central Florida region, altering the soil composition, food-web, native plant and animal community, and ultimately, an area’s ecological balance. Many invasive species have proven extremely difficult, or impossible to eradicate, and are costly to control once established. Thus, stringent measures to avoid unwanted species are justified both ecologically and economically. The United States Department of Agriculture Invasive Species Information Center defines invasive species as plant, animal, insect or microbial organisms that are “1) non-native (or alien) to the ecosystem under consideration and 2) whose introduction causes or is likely to cause economic or environmental harm or harm to human health.” Research has shown that invasive species negatively affect over half of the species listed as endangered or threatened and that around $100 billion is spent every year controlling them. The University has 47 known species of exotic plants on site, of which 23 species are listed as Category I, 10 species as Category II, and the remaining are not categorized by Florida Exotic Pest Plant Council. Existence of these species in UCF’s natural areas greatly interferes with management goals of the University. In an effort to control these unwanted species, the University of Central Florida has joined forces with state & federal agencies, private landowners, and non-profit organizations to create the Central Florida Cooperative Invasive Species Management Areas (CF CISMA). 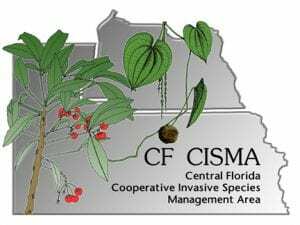 The CF CISMA’s mission is to create a partnership that develops resources, educate, and share information to manage invasive species in a specified area. Information on free training dates, partners, control methods, species identification, and projects can be found by visiting http://www.floridainvasives.org/Central/. Many invasive species have proven extremely difficult or impossible to eradicate and costly to control once established. Thus, stringent measures to avoid unwanted species are justified both ecologically and economically. The University has 47 known species of exotic plants on site of which 22 species are listed as Category I, 10 species as Category II, and the remaining are not categorized by FLEPPC. Existence of these species on the site is extremely undesirable and a management plan is in place to keep these species from infesting our natural areas. You can view our current weed management plan here. LNR has teamed up with UCF’s Recreation and Wellness Center (RWC) to remove invasive trees by the RWC challenge course, which can be seen from Central Florida Blvd. 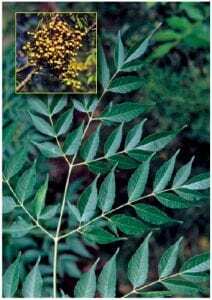 The chinaberry tree, Melia azederach, belongs to the mahogany hardwood family and was introduced to the United States from Asia in the late 1700’s. This tree has allelopathic properties, meaning it produces chemicals that keep other plants from inhabiting the area. 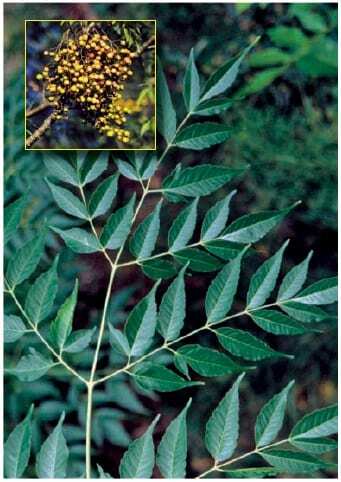 Allelopathy allows the chinaberry to take over a habitat, forcing out native plant species that previously thrived there. The berry of the tree is poisonous and can paralyze some bird species when ingested. LNR is planting Florida native trees in place of the invasive species. The area will be inspected monthly to ensure that the invasives do not come back, since seeds can lay dormant for months or years. The beetles have arrived at UCF and are ready to do their work! UCF’s Landscape and Natural Resources (LNR) Department is participating in a biological control program to help control the invasive air potato (Dioscorea bulbifera) by releasing a natural predator that feeds heavily on the invasive vine. Air potato, which is native to tropical Asia, was introduced to North America in the early 1900’s. Since its arrival it has established itself in moist hammocks and other natural areas throughout the South. This aggressive vine can grow several inches a day in the growing season and cover tree canopies, smothering them from sunlight. A beetle that feeds on air potato in its native range was studied for several years to see its potential as a biological control. Studies were done to ensure the beetle is host specific and that it does not feed on any other plant species, particularly Florida’s native plants. The beetle is known as the Air Potato Leaf Beetle (Liliocerus cheni) and females can lay more than 1,200 eggs during its lifetime. The Florida Department of Agriculture and Consumer Services, Division of Plant Industry is currently rearing the beetles for distribution around the state. UCF’s Natural Resources team will monitor the beetle and air potato populations following their release onto campus in June 2013 and report results back to the FDACS.